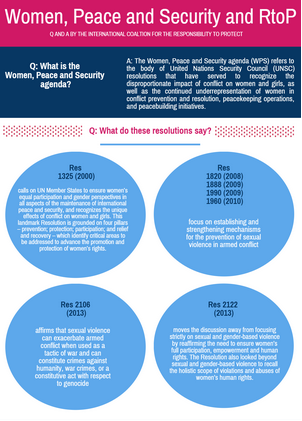 While the focus of the Women, Peace and Security agenda and the Responsibility to Protect differ in terms of scope and agenda, there are several ways in which they overlap and that work in these sectors can reinforce each other. Click to the left to learn more. To learn more about how RtoP relates to other sectors, view our publication “RtoP And… (English and French) and read"Arms and Atrocities: Protecting Populations by Preventing the Means". Over 40 child soldiers surrendered to Burundian security forces after being unwittingly recruited by a rebel militia. They are currently imprisoned in Burundi, but many human rights defenders are calling for their release, citing Burundi's ratification of the International Convention on the Rights of Child. The UN Relief and Works Agency for Palestine Refugees (UNRWA) announced a severe financial deficit, meaning many Palestinians may be cut off from access to much-needed humanitarian services. Amnesty International and Forensic Architecture released new evidence showing that Israeli forces, in retaliation for the capture of an Israeli soldier, may have committed war crimes and possible crimes against humanity during "Black Friday" last year in Rafah. The Israel Defense Forces declared that they would widen their investigation into their soldiers’ conduct during last summer’s war in Gaza, including through examining the bombing of a civilian clinic. Militants, suspected to be Boko Haram members, conducted raids and kidnappings of an estimated 30 people surrounding Lake Chad, in which three civilians and thirteen Boko Haram militants were killed. A child suicide bomber detonated herself in a crowded Damaturu city market in Yobe state, killing at least 16 people with an estimated 50 others injured. Two other would-be suicide bombers were reportedly arrested. Nigerian soldiers halted a Boko Haram attack in the town of Buratai in Borno State, while also rescuing 30 civilians, mostly children, in another part of the region. Nigeria appointed Iliya Abbah as the General for the Multinational Joint Task Force to fight Boko Haram, though there is still no clear date for the force's deployment.